Two powerhouses Astralis and NaVi have played a hard match against each other on first day of FACEIT London Major. 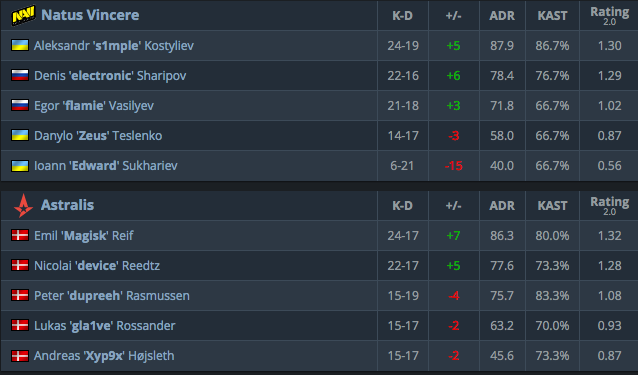 NaVi started strong after taking pistol as s1mple made 3k to give it’s team important advantage for next two rounds. However Astralis had other plans as they turned result around as they won next 7 out of 8 rounds to get lead of 7:4. NaVi carried by s1mple and Electronic managed to get their CT side under control and finish half with lead 8:7. Astralis won second pistol round as they battled their was over quad to A site and secured the plant. Ioann Edward Sukhariev wasn’t able to clutch 1v2 as Peter Dupreeh Rasmussen made a quick work of him. Danes were better team in second half as they won next 6 out of 7 rounds and gained a big lead. NaVi looked like they have no answer to Astralis attacks which in almost all rounds managed to plant the bomb, which helped their economy a lot. Finally NaVi managed to stop Astralis in 26th round but Danes survived with 4 players alive so their economy was still great. Even though Astralis had great run NaVi managed to strike back and equalize the game 14:14. Even though NaVi got close Astralis took two rounds in a row to finish the match 16:14.